Way to go, you survived The Searing Plague event! You held off the Outbreak Bar, battled pro-plaguers, feverishly researched a cure, used a wide variety of mathematics, theorycrafted, chatted with sentient bots, and cured a lot of plagued Elyrians in the process! As a result, you successfully achieved 6 out of the 8 Cure Bar milestones and won yourselves five Searing Plague event in-game item rewards. Congratulations! 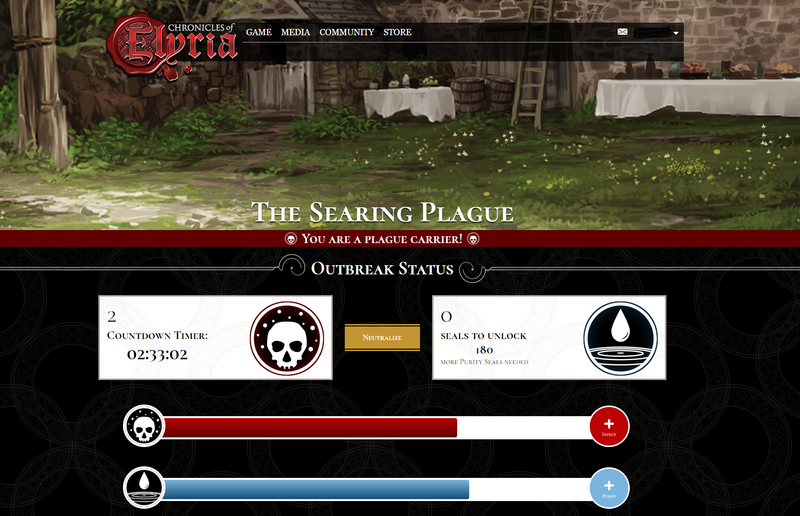 Starting on August 3rd, 2018 and finishing last Friday, September 14th at 12pm PDT, the Searing Plague Event brought together thousands of new, current, and returning Chronicles of Elyria players in a gargantuan effort to band together (in spite of some working to perpetuate the spread of plague) to determine the outcome of an epic part of Elyrian history. Depending on the weekly outcome, the lore for the event unfolded and ultimately made its mark as Elyrian historical canon. If you want to catch up on all of the lore that was revealed as a result of your actions, check the Searing Plague blog post here. Via the event landing page, the special event Discord channel and forum, our community processed, posted, and messaged tens of thousands of times in an engagement event that transcended our expectations. The studio was eager to see how the history of Elyria would unfold based on your actions, and we remained very neutral during the event. These events are important to us, as having a growing, engaged, and healthy community during development and before-launch is the surest way to ensure a healthy, engaged, and sustained community post-launch. As a result of your incredible efforts and to reward your accomplishment, all pure players who have qualified for a tier 2 role in the event will receive the title "Plagueborn" that can be applied to one of your characters. This character will gain a resistance to the Searing Plague and that trait can be inherited by your character's descendants! These items will be deposited into the accounts of all qualified winners in the near future. 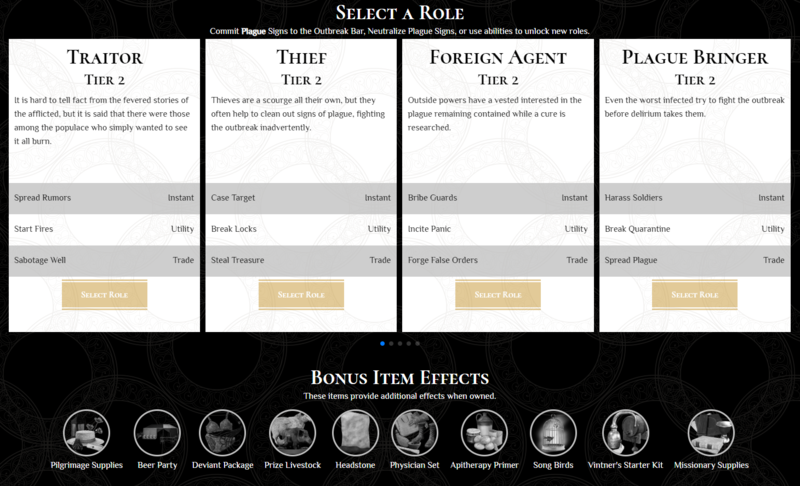 Note: To receive the in-game rewards, you must have performed at least 30 actions as a pure player (someone who has any pledge package) to have been eligible for a Tier 2 role. It does not matter if you had that role selected at the event completion or not. Thanks for sharing your leadership skills; we're excited to see what roles you'll play in Elyria one day! 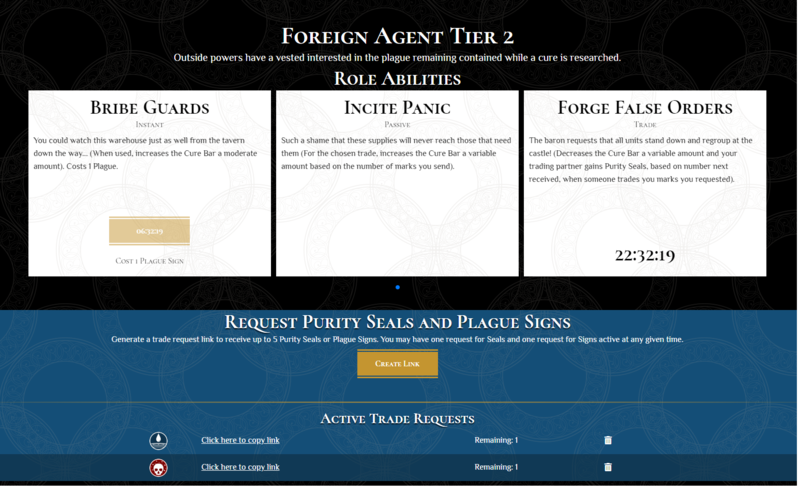 Additionally, we'd like to give a shout out to Forien for his awesome Searing Plague progression chart! Ultimately, we at Soulbound Studios would like to thank each and every one of you for your participation and passion during this event. It was truly a sight to behold! We could continue to wax poetic about all of the unique experiences we witnessed, how the event evolved, what the milestones meant and how the dynamics, math, how proclamations of the groups altered hearts and minds, and so much more... but with so much still to be done for Elyria to become a reality, we decided to leave that to your ancestors to pass on, and for bards to sing about. This reminded me of a bad browser game cooldown revisit mechanic. On a more pragmatic approach, as a feedback, I didn't find very clear what to do and all the mechanic aspect of this event. A simple summary of explanations on the Event page (where are the buttons), on how it works and what we are suppose to do, and what are the consequences would have been appreciated. As non-english native, I'm not reading every text (especially the long one). So I didn't appreciate it very much. On a more pragmatic approach, as a feedback, I didn't find very clear what to do and all the mechanic aspect of this event. A simple summary of explanations on the Event page (where are the buttons), on how it works and what we are suppose to do, and what are the consequences would have been appreciated. As non-english native, I'm not reading every text (especially the long one). So I didn't appreciate it very much. As for Plague players ... my feedback would be that if a Plagued player had tier 2 roles and subsequent buys the game (even if they didn't get cured in the event) they ought to have the shinies too. ... or perhaps just give all Plagued players an item Pure players can't have. Say ... an old bottle of plagued water. Nothing bad could possibly come of that ... right? As for Plague players ... my feedback would be that if a Plagued player had tier 2 roles and subsequent buys the game (even if they didn't get cured in the event) they ought to have the shinies too. ... or perhaps just give all Plagued players an item Pure players can't have. Say ... *an old bottle of plagued water*. Nothing bad could possibly come of that ... *right*? We all had characters, with skills and abilities that we used ... and our efforts and follies played out in text in Discord, neatly wrapped up into the lore blog. Thank you SBS for running the largest MUD I've ever seen! I have a feeling I JUST missed out on those 30 transactions. Dang Glad we won though! Given that I am the family-member that had to deal with The Searing Plague and my descendants 300 years hence will barely remember this effort I say to my future family "You missed it kids! I was there with the Think Tank heavys, that's right I knew Carewen and Hinata and Cimm and Sin". Heck, I got started as a banker because Cimm yelled out the window that she was alone and needed some lazy-assed folks to get in there and help out! That's right, Cimm yelled and I jumped (of course I was on my way to start a foundation for my descendants but instead I dumped all my purity into the community bank - sorry)". Since you whippersnappers will think you are all that with your plague masks and tincture and hardly remember those of us who fought for you so long ago, I want my family to erect a statue to me so as to remember me during their family reunions. The inscription should read "Hey you kids, get off my lawn!" I would have really liked to get some insight in to the real, behind the scenes, mechanics for this event. A lot of it seemed a bit unclear from a functionality perspective, and despite claims that the lore gave explanation, I think it would be nice to get some details on what the heck actually happened. Changing rates, changing ability impact, hidden goals, etc. made things very murky. I know Caspian and Snipe both claim they didn't make any random changes during the event - changes we saw were all planned ahead of time. If that is the case, I would love to see what those "planned" changed were, and how they tied into the lore. I would have really liked to get some insight in to the real, behind the scenes, mechanics for this event. A lot of it seemed a bit unclear from a functionality perspective, and despite claims that the lore gave explanation, I think it would be nice to get some details on what the heck actually happened. Changing rates, changing ability impact, hidden goals, etc. made things very murky. I know Caspian and Snipe both claim they didn't make any random changes during the event - changes we saw were all planned ahead of time. If that is the case, I would love to see what those "planned" changed were, and how they tied into the lore. A great experience and Event - great job all and SBS! - and even more pleasing because we gained victory over the Searing Plague. Occasionally I catch myself still clock-watching and thinking 'Submit Purity!'... (it'll wear off soon, I guess). Can't wait for CoE to start. How many of those accounts were upgraded? I am under the impression that quite a few of those new accounts were also upgraded once they had gotten their cure. It would be nice to know how many more Mayors we now have for example. In general, some more info how the marketing side of the event went would be fun to see. Like, how many Trollmount Salamanders were sold, how many physician kits, etc. Good stuff! How many of those accounts were upgraded? I am under the impression that quite a few of those new accounts were also upgraded once they had gotten their cure. It would be nice to know how many more Mayors we now have for example. In general, some more info how the marketing side of the event went would be fun to see. Like, how many Trollmount Salamanders were sold, how many physician kits, etc. Do we have cure statistics of the kingdoms as well or do we just have the group numbers? I'd be interested to see how well the kingdoms did. Well done to everybody who cured Plagued folks! I reengaged with the site only a few days before the end of the event and so was dumping into the cure bar like mad whenever I had 5 signs. But it made me smile to see people organising cures. And it's wonderful that all those cured will start the game with a regular package. That was--in my opinion--a wonderful incentive for them to join up. I hope I can assist new folks in some kind of similar fashion in future now that I'm back to following the site. Well done to everybody who cured Plagued folks! I reengaged with the site only a few days before the end of the event and so was dumping into the cure bar like mad whenever I had 5 signs. But it made me smile to see people organising cures. And it's wonderful that all those cured will start the game with a regular package. That was--in my opinion--a wonderful incentive for them to join up. I hope I can assist new folks in some kind of similar fashion in future now that I'm back to following the site. Looking forward to seeing everyone react in game to the searing plague! Well done!! Nice amount of people getting accounts there. Way higher than what I was thinking. More so since people weren't curing full time the whole event. Thanks for the debrief, much appreciated. One day the plague lord will reclaim his kingdom! why isnt the "over 4000" an "over 9000"? thats the right citation, right? and at least what rellik posted, he was there, afair. and I agree, at least I'd like to know what happened after three weeks. What happened that made our instants better? ...next event with contracts and OPC scripts? why isnt the "over 4000" an "over 9000"? thats the right citation, right? and at least what rellik posted, he was there, afair. Sure, over 4000 is over 9000... but the last sounds even more crazy... and I agree, at least I'd like to know what happened after three weeks. What happened that made our instants better? ...next event with contracts and OPC scripts? Yes, it is a very big turn of the event. Without that daily decrease of 2.5-3% plague, we wouldn't have won this battle and yet nobody seem to know what exactly happen on that day unless we got some more statistic backup from DEV. Posted By **Gromschlog** at 07:14 AM - Tue Sep 18 2018 > and I agree, at least I'd like to know what happened after three weeks. What happened that made our instants better? > Yes, it is a very big turn of the event. Without that daily decrease of 2.5-3% plague, we wouldn't have won this battle and yet nobody seem to know what exactly happen on that day unless we got some more statistic backup from DEV. Despite some complaints I heard about the team not working in the game, or how silly it was to click buttons every 4 hours, and so on, I still think this was a very positive event. The community as a whole was getting in a rut of sorts, pulling back and being less involved. This brought a lot of them out of that and many new ones into the community, so I'm very glad it was held. I saw many quiet ones come out of their shells and shine amidst the chaos of trying to organize so many people to work toward a common goal. Also the many others that continued to convince others to do the same so we could win. This was also partly what gave me the idea to try and hold large community events. I think it's very good for us to do this once in a while and even after launch to share experiences from whichever server we play on. Thank you sbs. I wonder what the other 2 milestones would've been. Cool event, thought i wish i could've participated a bit more. At least it gave us some idea of how other future events could unfold into CoE's stoyline. I wonder what the other 2 milestones would've been. Cool event, thought i wish i could've participated a bit more. At least it gave us some idea of how other future events could unfold into CoE's stoyline. I am so proud to have had 3000 new members. I want to give a Kudos to Luminios of Al-Khezam for his organization and leadership of our plague effort. With much effort and assistance from Nongenti, Sawahya, GhettoMaster, Horus, Pasukaru֍, and Rofus, along with all the help from the other participants from almost every EU community and quite a few NA folks, we were able to cure 67 people and elevate them to T2. (we could have cured many more had they come forward at our offers) Considering how small our overall effort was in comparison to some others, I would say we did one hell of a bang up job. I have already voiced my criticisms and disappointments with the event, so now it is only fair that I offer a sincere thanks to Serpentius, Brizanda and all of the team that brought this together for us, I will never stop being critical when I feel it is needed. I will never stop being a sarcastic smartass because it is who I am. Neither of those things mean I am unappreciative. Kudos to the team, as well. I want to give a Kudos to Luminios of Al-Khezam for his organization and leadership of our plague effort. With much effort and assistance from Nongenti, Sawahya, GhettoMaster, Horus, Pasukaru֍, and Rofus, along with all the help from the other participants from almost every EU community and quite a few NA folks, we were able to cure 67 people and elevate them to T2. (we could have cured many more had they come forward at our offers) Considering how small our overall effort was in comparison to some others, I would say we did one hell of a bang up job. ! 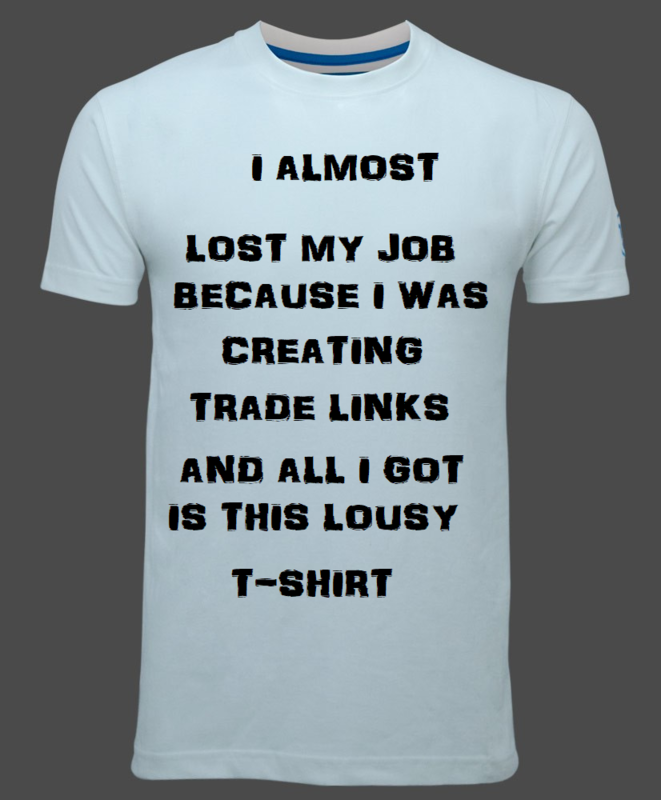 (https://image.ibb.co/etzeRe/PLAGUE_tshirt.png) I have already voiced my criticisms and disappointments with the event, so now it is only fair that I offer a sincere thanks to Serpentius, Brizanda and all of the team that brought this together for us, I will never stop being critical when I feel it is needed. I will never stop being a sarcastic smartass because it is who I am. Neither of those things mean I am unappreciative. Kudos to the team, as well. Amazing event!!! Can't wait for the next one for us as an Elyrian collective to conquer for the greater good of Elyria. Great job everyone!!! Thanks SBS for providing us this opportunity to come together as one to achieve the goal of uniting as a community! I still have an alarm to trade before reset. What do I do now?! While I have my reservations and criticism regarding the event, in the end, imo, several things could have been better. But ultimately, this is a good first step to such events and a big step up from the ones we had at PAX. I hope that all the data and feedback you've gathered will go to perfecting future, similar events. On a good note however, I would also like to thank SBS for giving us opportunity to help other members, in a way where they could acquire the game for (basically) free. It was a great deal for us and a generous move from you. So once again - thank you. While I have my reservations and criticism regarding the event, in the end, imo, several things could have been better. But ultimately, this is a good first step to such events and a big step up from the ones we had at PAX. I hope that all the data and feedback you've gathered will go to perfecting future, similar events. On a good note however, I would also like to thank SBS for giving us opportunity to help other members, in a way where they could acquire the game for (basically) free. It was a great deal for us and a generous move from you. So once again - thank you. With all the newer MMO's out there trying to dig into your pockets it's nice to see one that really care's about there fans and the fun they are having. SBS is one of the few that has ever created a event for alpha or beta before the release of the game. The last one I can remember was Ashron's Call many many years back. So thank you SBS for caring and this is just more evidence how much you care about your game and fans. This is the real question to ask here. What happened? "What happened 8/26 that caused the plague bar to begin declining???" - Nienori This is the real question to ask here. What happened? Not sure, but it happens to be three days after the Vintner's Kits and Missionary supplies started having effect. Also only six days after the community became able to switch roles, thus possibly a bigger community push for soldiers happened as well. Posted By **Massalian** at 10:46 PM - Mon Sep 17 2018 > > "What happened 8/26 that caused the plague bar to begin declining???" - Nienori > > This is the real question to ask here. What happened? Not sure, but it happens to be three days after the Vintner's Kits and Missionary supplies started having effect. Also only six days after the community became able to switch roles, thus possibly a bigger community push for soldiers happened as well. This was a lot of fun! Cheers and congrats everyone. Thanks for the event guys! It was an incredibly fun and exciting experience for me. Being deeply involved in the event as it progressed and changed, As groups discovered more information on how everything worked, and as these groups developed ever changing strategies to fight the plague. It was all so interesting and rewarding for someone like me, and I really enjoyed the event. The community truly made this event the amazing experience it was. What happened 8/26 that caused the plague bar to begin declining??? According to the post with quotes from the devs, time moved faster because the historian chick, Aruna or whatever her name is, doesn't see second for second time. She sees events. Posted By **Nienori** at 3:36 PM - Mon Sep 17 2018 > > What happened 8/26 that caused the plague bar to begin declining??? According to the post with quotes from the devs, time moved faster because the historian chick, Aruna or whatever her name is, doesn't see second for second time. She sees events. Thank you for the response. I'm not finding any quotes about that in this post or the Searing Event Lore post. Can you direct me to where I can read that? And congratulations to all the new and old folk in the community for receiving a free Elyrian pledge! WELL DONE EVERYONE! And congratulations to all the new and old folk in the community for receiving a free Elyrian pledge! Awesome guys, it was nice to share this event with you all!